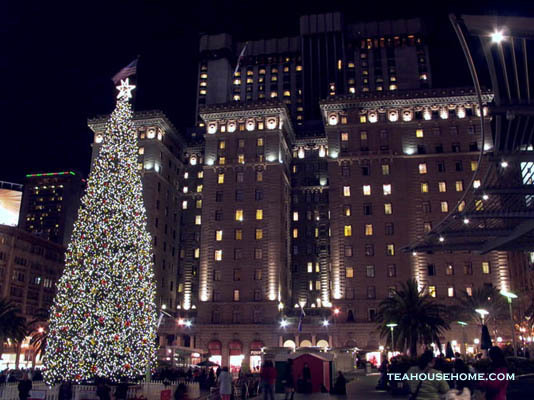 Image: San Francisco's Union Square on the evening of December 23rd. I hope that you are having a relaxing, relatively worry-free holiday season! I hope these dark days of winter are filled with lights, good food, and even better company for you. I'd like to give a special thanks for the gifts of friendship I've received in recent years: your time and camaraderie have meant more to me than anything that could be contained in a package. You people who have gamed at my house, screened movies in your apartments, organized hikes, rented snow cabins and went on improbably challenging snowshoe hikes with me, napped on my floor, biked with me at demonstrations, printed cyanotype photograms with me (there are more than a dozen of you now! ), gone for long walks in drippy wet fog, exchanged significant looks with me showing that you understood me perfectly, had text chats with me at 2 a.m., laughed at my jokes, brought me treats when I was under the weather, laughed so hard you cried watching Blazing Saddles again (after all those years), carved pumpkins with me, praised my soups, exchanged long and heartfelt letters with me... You mean so much. I'll be thanking you individually over the course of the rest of my hopefully long life, but I'm struck with thanks right now, so here it is.